LaserMax strives to ensure that every customer is satisfied with their purchase of our product. Our U.S. based Customer Service team ready to answer any question you may have about your LaserMax product. 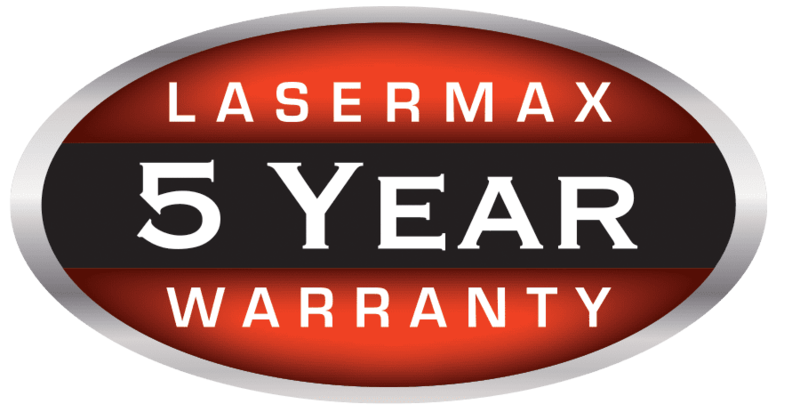 LaserMax products carry a 5 year limited warranty and we stand behind our product with a customer service team that strives to exceed customers expectations in both quality, value and customer care. Contact us today, we are here for you. Are LaserMax laser sights visible in the daylight? No commercially-available laser sight that is powered within the limits dictated by federal law is effective for stress fire situations in broad daylight beyond a very limited range. Indoor and low light environments present the best conditions for a laser sight to be clearly seen. Within these environments, the pulsing LaserMax aiming point can be identified far beyond the average shooting distances. Are green lasers brighter than red? Although individual perceptions vary, the shorter wavelength of green light is more immediately visible to the human eye than light produced at any other point of the spectrum. While our eyes are adapted to see green better, all of LaserMax’s commercial lasers are 5 mW (the highest power output permitted by law), so green lasers are not technically any brighter than the red. Will I see the LaserMax laser beam all the way back to the firearm? The light that a LaserMax laser emits is seen as either a pulsing or solid dot on target, not a visible beam like you may see in movies. Any visible beam of light you perceive is produced by the reflection of particles or contaminants in the air. The laser will NOT produce a line connecting the target to the laser source. Does a LaserMax require batteries? With the exception of the rechargeable Genesis laser system, all LaserMax products are powered by disposable batteries. LaserMax has optimized the power usage in all LaserMax sights and illumination tools. Replacement batteries can be ordered directly from the LaserMax store and are also readily available through electronics or camera stores. Consult the LaserMax Operator’s Manual for complete battery removal and replacement instructions. Will I have to take my gun to a gunsmith to have the Guide Rod Laser installed? No! If you can field-strip your firearm to clean it, you can install the LaserMax Guide Rod Laser in just a matter of minutes. Watch a LaserMax installation video for complete step-by-step instructions. Is it possible to install the Guide Rod Laser wrong? Yes. Although installation of the Guide Rod Laser only requires a few simple steps, proper function and alignment relies on the system being installed correctly. In addition to reading the LaserMax Operator’s Manual carefully, it is recommended that you view an installation video prior to first installation of the sight. Important: Proper installation of the LaserMax system requires familiarization with safe disassembly of the firearm. Carefully review the field-stripping instructions provided by the firearm manufacturer prior to attempting to install the LaserMax sight. Will installation of the Guide Rod Laser void my firearm factory warranty? Absolutely not! The LaserMax system requires no permanent alteration to the firearm and will neither degrade its function nor void the manufacturer's warranty. The firearm can be easily restored to original factory condition simply be removing the LaserMax parts. Does the Guide Rod Laser require cleaning? After repeated fire, the Guide Rod Laser lens may become clouded with powder residue, impairing its brightness. For best results, it is recommended that the laser lens be cleaned along with the firearm after use. To clean, follow these steps: 1. Ensure the firearm is clear and remove all ammunition from the work area. 2. Keep firearm pointed in a safe direction with finger off the trigger. 3. Confirm that the laser is off. 4. Dampen the end of a cotton swab with isopropyl alcohol. 5. Apply dampened swab to laser lens and polish in a small circular pattern. Be sure to clean around the edges of the lens. Important: the Guide Rod Laser should never be submerged or flushed with cleaning solutions or solvents. What other kind of maintenance will my Guide Rod Laser require? Aside from changing the batteries and replacing the battery cap, no other maintenance is generally required. High volume shooters should follow the same recoil spring replacement guidelines dictated by the firearm manufacturer. Will I have to purchase a special holster to accommodate the Guide Rod Laser? No, unlike lasers that change the exterior dimensions of the handgun, a LaserMax Guide Rod Laser will be compatible with your standard holster. Is the activation method consistent with proper firearm handling? Definitely! Both firearm experts and law enforcement specialists agree that the operator’s index finger should remain along the side of the firearm frame while aiming and should only enter the trigger guard area when he or she is prepared to fire. This position places the finger at the slide lock/take-down lever, exactly where the LaserMax activation lives. Will the Guide Rod Laser make my pistol jam? No! LaserMax guide rods and springs meet or exceed the manufacturer's standards. As long as you have properly installed the correct model Guide Rod Laser, your firearm will operate just as it did prior to installation. Why does my laser "jump" off the barrel lug? When installing the Guide Rod Laser, the system is situated on the barrel lug as a temporary holding position to aid in ease of installation. After mating the slide with the frame, the guide rod naturally shifts into the correct alignment position inside the frame and on the activation switch. My laser comes on in my pocket. How can I prevent this? The LaserMax laser is designed for holster carry, which not only increases the overall safety of the firearm but protects the laser from inadvertent activation. LaserMax recommends the use of leather, Kydex or a leather/Kydex hybrid holster. Please visit the Accessories page to view some great options. What is the difference between Gen 3 and Gen 4 Guide Rod Lasers for Glock? Since Glock’s Gen 4 pistol models have a larger diameter guide rod opening, separate LaserMax models had to be created to fit these unique parameters. Important: LaserMax’s Glock Guide Rod Laser models are not interchangeable. You will need to order the model that was designed specifically for your firearm. If you are not sure which model fits your firearm, refer to the Product Selector for assistance in choosing the correct model. Will I have to take my gun to a gunsmith to have the CenterFire laser installed? Definitely not! The CenterFire simply clamps around the trigger guard and is tightened with a few screws. No permanent modification is required. How do I change the batteries in my CenterFire? You will need to remove the mounting screws and lift up on the smaller left side plate. Once you have access to the battery compartment you will lift out the 1/3N battery, replace it with a new one, and then reinstall the side plate and screws. Refer to your Operator’s Manual for complete details. What is this red "O" ring for? When changing the batteries, you may note that there is a red or white “O” ring in between the coils of the battery connection spring. This part helps secure the battery connection for your laser. If the “O” ring comes out, just place it back between the coils of the battery connection spring under the battery. Will my CenterFire-equipped handgun fit in my current holster? In most cases it will be necessary to purchase a new holster to accommodate your CenterFire laser-equipped firearm. For some options, please visit the Accessories page. Does the CenterFire require any cleaning or maintenance? After repeated fire, the CenterFire lens may become clouded with powder residue, impairing its brightness. For best results, it is recommended that the laser lens be cleaned along with the firearm after each use. To clean, follow these steps: 1. Ensure the firearm is clear and remove all ammunition from the work area. 2. Keep firearm pointed in a safe direction with you finger off the trigger. 3. Confirm the laser is off. 4. Dampen the end of a cotton swap with isopropyl alcohol. 5. Apply dampened swab to laser lens and polish in a small circular pattern. Be sure to clean around the edges of the lens. Important: Do not submerge or flush the CenterFire in cleaners or solvents. The CenterFire laser is designed for holster carry, which not only increases the overall safety of the firearm but protects the laser from inadvertent activation. LaserMax recommends the use of leather, Kydex or a leather/Kydex hybrid holster. Please visit the Accessories page to view some great options. My CenterFire laser is pulsing. How can I prevent this? Many CenterFire laser sights are configured to enable the user's choice of two modes of operation. To change from steady to pulsing or from pulsing to steady, follow these steps: 1. Clear the firearm and remove all ammunition from the firearm and work area. 2. Keep firearm pointed in a safe direction with your finger off the trigger. 3. Turn the laser on. 4. Once on, press the activation switch a second time and hold it in place for 5-6 seconds until it 5. changes to the other mode. 5. Release the activation switch. Your laser will stay in the selected mode until you repeat the steps to change it back. Why can't I purchase a CenterFire for my Colt Mustang through the LaserMax site? The CenterFire laser system that LaserMax produces is sold exclusively through Colt. You can purchase these through many fine shooting sports retailers, or directly through the Colt website. Will the Micro fit on my full size handgun? The Micro was specifically designed for use on compact and subcompact handguns. While it will fit your full size pistol, in many cases you may not be able to reach the activation switch without the aid of your support hand. A better choice would be the UNI laser system, which provides a perfect fit and easily accessible activation for full size handguns. Visit the LaserMax Product Selector to determine the best fit for your firearm. Can I install my Rail Mounted laser sight on a rifle, as well as a handgun? Yes. LaserMax Rail Mounted Lasers fit on any Picatinny or Weaver railed interface, whether it is on a handgun, long gun, or other equipment. In addition, UNI and Genesis laser systems are sold in a Rifle Kit which includes a remote pressure switch and rail grabber, everything you will need to customize your long gun. Are LaserMax Rail Mounted laser sights adjustable? Yes. All LaserMax Rail Mounted Lasers are fully adjustable for windage and elevation using the supplied hex wrench and instructions. Consult your Operator's Manual for complete instructions. Can I mount a LaserMax Rail Mounted laser sight on my compound bow? Yes. LaserMax Rail Mounted Lasers can be attached to any Picatinny or Weaver rail of sufficient size (minimum 1-inch for Genesis and Micro, minimum 1.75 inches for UNI). Common platforms that LaserMax sights are used for include compound bows, crossbows, remote operated camera systems, and countless others. Will a LaserMax Rail Mounted laser sight work with my holster? No. Installation of any external handgun device will alter the overall size and shape of your holster and necessitate a holster change. The only exception would be for “universal” fit holsters that offer some dimensional flexibility. LaserMax has partnered with a number of manufacturers to offer quality holster options. Visit the Accessories page for more information. Can I change the battery in my laser without removing it? Yes. All LaserMax lasers are designed with easy battery change in mind. Refer to your Operator's Manual for complete details. I am neither active military nor with a law enforcement agency. Can I still buy an IR laser? Yes! To purchase an IR laser through the LaserMax website, you must simply provide proof of your status as a US person in compliance with ITAR regulations. LaserMax is proud to offer class 1 IR lasers in the Micro and UNI rail mounted platforms, and now also offers select Guide Rod Lasers in infrared as well. To ensure maximum visibility with Gen 1–3+ night vision devices, all LaserMax IR lasers available are manufactured to the highest output commercially permitted. Do I need night vision to see my IR laser? Yes. Night Vision Devices (NVDs) are required to view an IR laser sight. This is due to the fact that infrared (IR) light is emitted at a wavelength outside a human being’s visual light spectrum. For this reason, LaserMax IR lasers make great tools for everything from duty use and home protection to hunting and recreational shooting. Why can't I order the Pico Integrated Light and Laser Housings from the website? The Beretta Pico Housings that LaserMax produces are commissioned specifically for Beretta. You can purchase these through the Beretta website. Will the Shotgun Tri-Rail Adapter work on my shotgun? I have a low-profile gas block without a front sight on my AR. Will the AR Rail Adapter fit? I did not receive confirmation by email. How do I know if my order went through? Please check your spam filter. Although LaserMax order confirmations are automatically generated from the shopping cart, some email filters may mistake this as spam. If you are unable to locate your confirmation number, please do not duplicate your order. Instead, contact LaserMax Customer Service during business hours, which are Monday–Friday, 8am–5pm EST. They will be happy to assist in locating your order details. Most items on the LaserMax website are in stock and will ship within 2–3 business days. Unless otherwise specified, all domestic orders ship via USPS Priority Mail with the exception of parts orders, which ship via First Class US Mail. Transit times vary depending on location. If your order does not arrive within 5–10 business days, contact LaserMax Customer Service for assistance. Please check your spam folder. Although LaserMax order tracking information is automatically forwarded to the email you provided at checkout, some email filters may mistake this as spam. If you are unable to locate your tracking number, please contact LaserMax Customer Service during business hours, which are Monday–Friday, 8am–5pm EST. They will be happy to assist in locating your order tracking details. My package shows as delivered, but I did not receive it. What do I do? LaserMax ships via UPS, USPS and FedEx. If you have received a delivery confirmation, please contact the appropriate carrier (UPS, USPS or FedEx) to confirm the status of your order. LaserMax can file a claim on your behalf, but in most cases, a more speedy resolution can be reached directly through the carrier. My order was rejected due to my zipcode. Why? 10451, 10452, 10453, 10454, 10455, 10456, 10457, 10458, 10459, 10460, 10461, 10462, 10463, 10464, 10465, 10466, 10467, 10468, 10469, 10470, 10471, 10472, 10473, 10474, 10475, 11201, 11203, 11204, 11205, 11206, 11207, 11208, 11209, 11210, 11211, 11212, 11213, 11214, 11215, 11216, 11217, 11218, 11219, 11220, 11221, 11222, 11223, 11224, 11225, 11226, 11228, 11229, 11230, 11231, 11232, 11233, 11234, 11235, 11236, 11237, 11238, 11239, 11241, 11242, 11243, 11249, 11252, 11256, 10001, 10002, 10003, 10004, 10005, 10006, 10007, 10009, 10010, 10011, 10012, 10013, 10014, 10015, 10016, 10017, 10018, 10019, 10020, 10021, 10022, 10023, 10024, 10025, 10026, 10027, 10028, 10029, 10030, 10031, 10032, 10033, 10034, 10035, 10036, 10037, 10038, 10039, 10040, 10041, 10044, 10045, 10048, 10055, 10060, 10069, 10090, 10095, 10098, 10099, 10103, 10104, 10105, 10106, 10107, 10110, 10111, 10112, 10115, 10118, 10119, 10120, 10121, 10122, 10123, 10128, 10151, 10152, 10153, 10154, 10155, 10158, 10161, 10162, 10165, 10166, 10167, 10168, 10169, 10170, 10171, 10172, 10173, 10174, 10175, 10176, 10177, 10178, 10199, 10270, 10271, 10278, 10279, 10280, 10281, 10282, 11101, 11102, 11103, 11004, 11104, 11105, 11106, 11109, 11351, 11354, 11355, 11356, 11357, 11358, 11359, 11360, 11361, 11362, 11363, 11364, 11365, 11366, 11367, 11368, 11369, 11370, 11371, 11372, 11373, 11374, 11375, 11377, 11378, 11379, 11385, 11411, 11412, 11413, 11414, 11415, 11416, 11417, 11418, 11419, 11420, 11421, 11422, 11423, 11426, 11427, 11428, 11429, 11430, 11432, 11433, 11434, 11435, 11436, 11691, 11692, 11693, 11694, 11697, 10301, 10302, 10303, 10304, 10305, 10306, 10307, 10308, 10309, 10310, 10311, 10312, 10314. Does LaserMax offer international shipping? No. LaserMax is unable to ship outside the United States. Due to export control laws and regulations, all orders made through the LaserMax store must have both billing and shipping addresses located within the 50 United States or District of Columbia. International dealers are encouraged to contact LaserMax’s international distributor. What is LaserMax's return policy? If the item you received is not the item that you ordered or is damaged in any way, LaserMax will make every effort to replace it as soon as possible at no cost to you. If you change your mind about an item you ordered or deem it be to be unsatisfactory for any reason, LaserMax will gladly provide a full refund or exchange within 30 days of the original purchase date. In the case of an exchange, shipping costs are the customer’s responsibility. What if the product does not function or is defective? LaserMax prides itself on uncompromising customer service and wants you to be a customer for life. If you are not completely satisfied with your LaserMax purchase, please contact LaserMax Customer Service during business hours, which are Monday–Friday, 8am–5pm EST. They will make every effort possible to correct the problem. Please note: Packages must be returned prepaid. LaserMax will not accept COD packages. LaserMax can only accept returns for products purchased through lasermax.com. All other returns should be to the place of purchase. Any and all refunds will be applied to the credit card used at the time of purchase. Please allow 10-15 business days from receipt of your package for processing. You may obtain a status of your return at any point during this time by contacting LaserMax Customer Service at 800.527.3703 or customerservice@lasermax.com. This product may be registered by completing a Registration Form which may be found atwww.lasermax.com/support or by contacting the LaserMax Customer Service Department at 1-800-527-3703. The LaserMax Limited Warranty extends specific legal rights to the registrant. Other rights, which vary from state to state, may also apply. This product is warranted to be free from defects in material and workmanship at the time of purchase. This limited warranty does not cover expendable parts (ex: batteries), that have definite and predictable life expectancies. This warranty does not cover products that LaserMax determines have been exposed to abnormal use in any way. Examples of abnormal use include, but are not limited to, damage from mishandling, misuse or abuse, damage from exposure to abnormal conditions, damage from improper care and maintenance, or installation of the product in or on any firearm model the product is not specifically advertised to be used with. Warranty coverage begins on the date of purchase and ends five (5) years after date of purchase. This limited warranty extends only to the original registrant and is non-transferable. To file a warranty claim, a warranty repair request must be submitted, and a Return Merchandise Authorization (RMA) number issued by the LaserMax Warranty Department, within five (5) years from date of purchase. Following submission of a warranty claim, LaserMax reserves the right to inspect the product to determine its eligibility for warranty coverage. If deemed eligible, LaserMax will repair or replace the part(s)/product that LaserMax, at its sole discretion, determines to be defective during the warranty period. If deemed ineligible, LaserMax will return the part(s)/product with an explanation of why coverage is not available. LaserMax reserves the right to replace defective part(s)/product with an equivalent substitute product at its sole discretion. Any and all implied warranties, including the implied warranties of merchantability, fitness for a particular purpose, and non-infringement, also begin on the date of purchase and end five (5) years after date of purchase. This limitation does not apply to residents of states that disallow limitations on the length of implied warranties. The preceding process is both the exclusive remedy and LaserMax’s exclusive liability for any warranty claim. LASERMAX WILL NOT, UNDER ANY CIRCUMSTANCES, BE LIABLE FOR ANY INCIDENTAL, INDIRECT, CONSEQUENTIAL, PUNITIVE OR EXEMPLARY DAMAGES (EVEN IF LASERMAX HAS BEEN NOTIFIED OF THE POSSIBILITY OF SUCH DAMAGES) RESULTING FROM OR RELATED TO A PRODUCT, INCLUDING, WITHOUT LIMITATION, ANY LOSS OF PROFIT, OPPORTUNITY, OR DAMAGES IN EXCESS OF THE PURCHASE PRICE OF THE WARRANTIED PRODUCT. THIS LIMITATION DOES NOT APPLY TO RESIDENTS OF STATES THAT DISALLOW LIMITATIONS ON INCIDENTAL OR CONSEQUENTIAL DAMAGES. Which factors contributed to your purchase? Where did you purchase your LaserMax product? Which features influenced your purchase? What other products would you like to see from LaserMax? At LaserMax, we pride ourselves on providing products of uncompromising quality and a level of customer care to match. Complete this Contact Form to receive a prompt response to your question or comment from a knowledgeable LaserMax Customer Service representative. Most inquiries are answered within 24 hours.